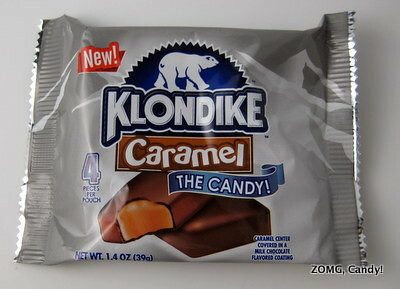 At the Sweets and Snacks Expo in May, Flix Candy was showing off their new Klondike candies. I got a free sample of each flavor, Caramel and Mint Chocolate Chip, for review. I’ll cover the Caramel today and save the Mint Chocolate Chip for Wednesday. 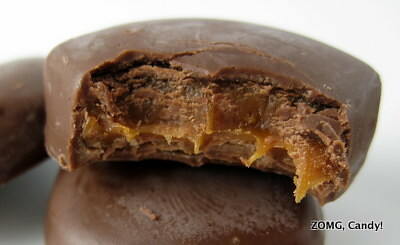 Caramel was described as “caramel center covered in a milk chocolate flavored coating.” Regular readers of the blog should hear alarm bells right now: “chocolate flavored” is a euphemism for “not actually chocolate”. In this case, it’s palm kernel oil instead of cocoa butter. Because of that swap, the mockolate had some greasy looking spots. It didn’t make much of a flavor impression, as the caramel really dominated the flavor profile. The caramel was soft and sweetly chewy with a light butterscotch finish. It got stuck in my teeth a bit but easily dissolved away with a little time. I found this inoffensive. The caramel was okay, if not the best, and the mockolate wasn’t noticeably fake, beyond the greasy sheen that it imparted. 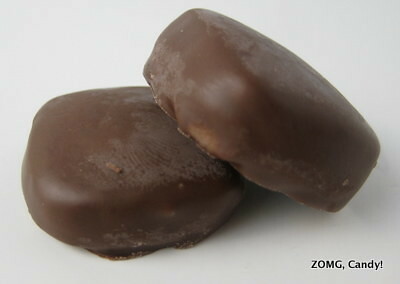 Still, there is better mass market chocolate covered caramels out there, like Riesens. An O. Candy reviews of all different candy types and candy brands from around the world! What’s the Best Hi-Chew Flavor? My Favorites Ranked! Jelly Belly Flavor Combinations That Will Blow Your Mind! What Are the 12 Flavors of Albanese Gummi Bears? Tic Tac Nutrition Facts – Beware! What’s the Airheads White Mystery Flavor? Which Candy Brand Has The Best Gummy Bears? 10 Most Loved Candies of All Time – Origins! Trolli Brite Gummy Worms – Slurpee Flavored! All of the opinions on zomgcandy.com are original and made without monetary interest in mind. We have never and will never write positive reviews for cash. That being said, we are a participant in the Amazon Services LLC Associates Program, an affiliate advertising program designed to provide a means for us to earn fees by linking to Amazon.com and affiliated sites.